The Lightning quilt block evokes an image of just what you think it would -- a look of a lightning flash. But, depending on whether you set the blocks on point or side by side, you can achieve an entirely different look. Don't forget also to try flipping the blocks, as I did in the sample straight setting, so that a secondary pattern appears. 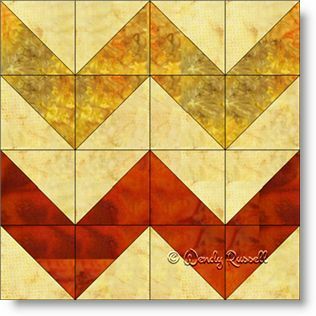 This quilt block is made entirely of half square triangles so it falls into the easy category as well as the intermediate category, due to the number of pieces needed to create the block.